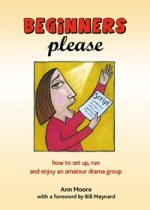 A highly practical guide to setting up and running an amateur drama group - whoever and wherever you are. Includes: Choosing a venue and establishing the group on a legal footing; play selection, finance, publicity and marketing; backstage personnel plus dozens of exercises for use in group meetings. Ann Moore has more than fifty years experience in drama, from acting to stage management, props to directing, working with both amateurs and professionals. She has directed regularly for thirty years and has taught drama to Secondary School pupils and adults. When I was production director for our drama group's pantomime I found Ann's book extremely useful. It was easy to understand, and it outlined the various tasks I had to do very well.